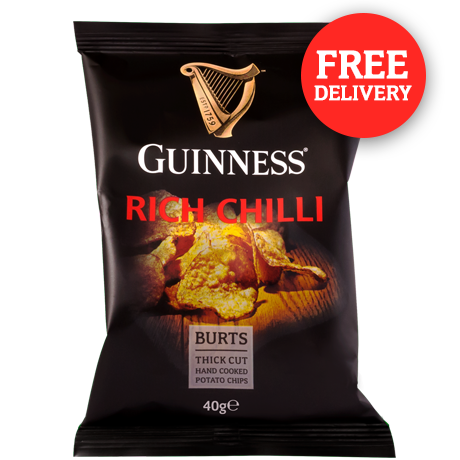 Fresh jalapeno chillies and juicy succulent beef flavours infused with the flavours of the world’s most iconic stout. These crisps will have you coming back crunch after crunch. Potato, sunflower oil, sugar, yeast extract powder, salt, natural flavouring (BARLEY), onion powder, paprika powder, BARLEY malt extract powder, garlic powder, ground cumin, chilli powder, tomato powder, herbs, ground ginger, acid: citiric acid, colour: paprika extract, chilli extract.